As usual, it's taking longer than I expected. I probably used this line before but.....they say, "Good things take time". 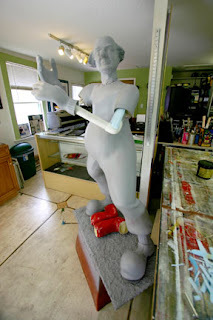 Almost all the fiberglass mess is completed....that ugle grey growth around Homer's neck is the 'scar' from where I removed that ugly frilly thing that he came with. His new arms are basically finished and I decided to lengthen his sleeves.....mostly because I cut them too short in the first place. Those of you familiar with these guys, at least, the group of Sarasota Clowns (no...I'm not talking about the City Council:-))...anyway....as I was saying. I had to give him a haircut. It's really only temporary. He'll eventually be wearing a batting helmet and it wouldn't fit over his current hair-do. So.....he'll be receiving a new one.....hair-do, that is...you'll see later. Once again I'm presented with the opportunity to do a little 'clowning around'. 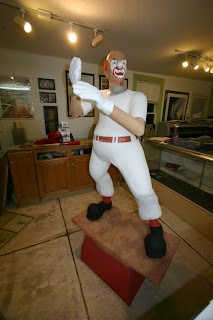 This time, meet "Homer", Tidewell Hospice's latest addition to their "Clowning Around Town" program to benefit their children's services program. 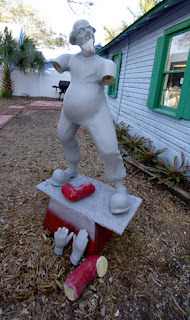 Homer is sponsored by the Cincinnati Reds and will be on display at Ed Smith Stadium, home of the Sarasota Reds. This particular clown also has what they call a 'celebrity artist'.....nope....not me:-) This one happens to be the one and only Jerry Springer, TV personality and Sarasota resident.